A used forklift is often a cost-effective option for employers with stricter budgets and a mildly demanding workplace. Whether you’re buying a used forklift from a dealership or private seller, selling your used forklift, or you’re trading in your used forklift for a different model, it’s important to understand the key factors to look for that can help you accurately value the lift truck. 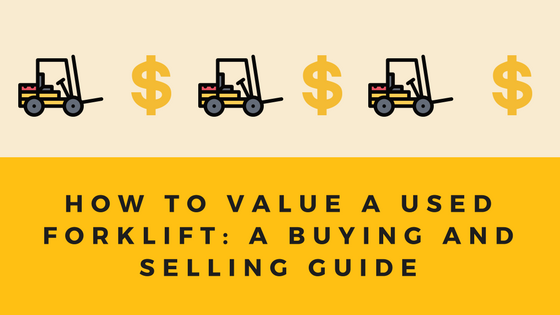 If you want to learn more about how to buy a used forklift, or how to sell forklifts that are used, this guide can give you a general understanding of the pricing and valuation process. When learning more about how to buy a used forklift, it’s important to know that there are a few parameters that drive up the price or can depreciate it. These parameters are: 1) The higher the operating capacity and lift power of the lift, the more it will cost. 2) Top brands are going to cost more than lesser known brands of forklifts. 3) Electric forklifts are generally more expensive initially than internal combustion forklifts. 4) Pneumatic tires are typically costlier than cushion tires. 5) Used forklifts can end up costing more than a new forklift. 1) The operating capacity of a forklift means how much weight it can handle. New or used, the more powerful the lift truck, the higher the price. 2) While forklifts depreciate like cars do, well-known and highly trusted brands will justify a higher price than less well-known brands. However, it’s usually because the brand name comes with better technology and greater productivity. 3) Electric forklifts come with multiple battery packs, battery chargers, and other battery equipment driving up the price compared to internal combustion forklifts. 4) Pneumatic tires are made with better traction and smoother driving than cushion tires, making them more expensive. Cushion tires are designed for indoor use and smooth surfaces. 5) If you use a forklift for more than four hours a day, a used forklift may end up costing you more in maintenance and repairs than purchasing a new forklift. To determine your buying needs, you need to assess the amount of work your business does on a daily basis. Used 3,000 lb. electric forklift’s average cost is between $5,000 and $10,000, compared to $15-$25,000 for a new electric forklift. Used 5,000 lb. internal combustion forklift costs $10,000-$15,000 on average, versus a new 5,000 lb. forklift at $15-$30,000. The annual operating costs based on a 250-day work year for electric forklifts is $1,500-$2,000, $12-$15,000 for diesel forklifts, and $10-$12,500 for petroleum gas-powered forklifts. Equipment depreciates off the lot just like cars, and you can come up with an appropriate ballpark value of the forklift by looking at the serial number stamped on or near the mast that reads the year. Research the price of new models of the same type of forklift and deduct the approximate depreciation from there, which is about 15% or less a year. Use this price as a base price before factoring in the other considerations. A forklift that was used for hours every day in extreme weather conditions lifting heavy loads of concrete or stone will age much faster than the same model and year of forklift that was only used a fraction of the time for lower impact work. You can compare the hours logged to the mileage of a car. All hours should be recorded, including the key hours and the dead man-hours, which include the times the forklift was used for lifting or transporting loads and are more accurate when determining the value of a used forklift. Extra features on a used forklift almost always bump the price. If the forklift has a computerized panel, air conditioning in the seating cab, automatic load weighing scales, and attachments, these all add to the value. To determine the added value of these features, take the price of the features new and subtract the approximate age depreciation and the fact that they are being sold as a package. The condition of a forklift depends on how well it was maintained prior to resale. The paint still intact, good tires, a damage-free mast, and a clean, well-maintained engine will factor into a higher value. You should also account for any parts or features that have recently been replaced. This section applies to you if you’re purchasing a used forklift and want to know the accurate value before buying. In addition to the above factors, a dealership that offers on-site services during convenient hours, that responds quickly to breakdowns, and has quality parts on hand will increase the value of the forklift because they will save you operating costs and will keep your fleet running smoothly. Whether you buy new or used forklifts, the fact remains the same; giving your operators the proper training and certification they need to drive forklifts safely is the most effective cost-saving and productivity-boosting decision employers can make. Check out the different forklift training courses from ForkliftCertification.com to find the program you need most in your business, for the type of forklift you actually use. With our online courses, it only takes workers one hour to complete their training, all from any device with an internet connection. Operators will also be 100% OSHA-compliant. Review this used forklift price guide for knowing how to buy a used forklift, or sell one, and sign up today on our website to find the top quality, affordable forklift training you need.